Optical methods are proliferating with the ready availability of light sources, detectors and optical components and devices. 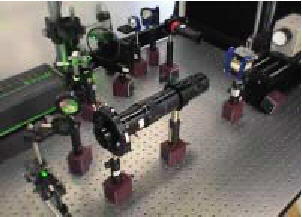 For mechanical measurements, optical techniques can be broadly classified into four main types - intensity sensors, diffraction-based sensor, interferometric sensors and polarization sensors. These are classified based on the optical property that is altered by the measurand. Ofcourse the final display is the intensity but the information it provides varies with the sensor used. 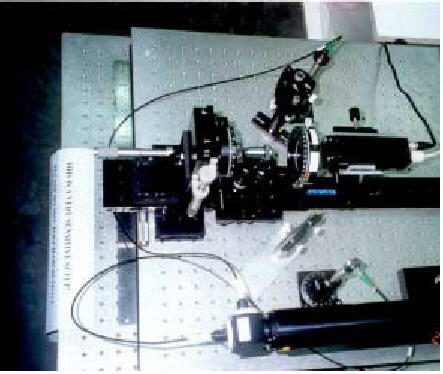 In this paper, some of the systems developed during the MoE funded research project on Optical Sensors for Mechanical Measurement - Design, Development and Application (Principal Investigator: Anand Asundi) funded by the Ministry of Education (MoE) and the Nanyang Technological University will be highlighted. Most of the methods described provide full field measurement of deformation of objects. More recent emphasis is on the development of techniques for micro-measurements applications as is frequently encountered in MEMS devices and micro-mechanics and sensors for bioengineering. The following systems will be briefly described. These systems prototypes are ready for commercialization and sales. Please contact the author for details. Obtaining a complete 360 0 view of a general 3-D object has become very important in many industrial applications, such as 3-D solid modeling, robotic 3-D vision, quality control, bio-stereometrics, numerically controlled machining. 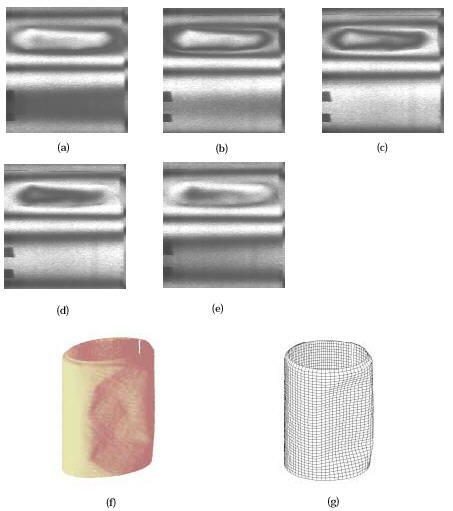 Fig 3a: Pattern with (a) zero offset, (b) one-scan-line offset, (c) two-scan-line offset, (d) three-scan-line offset, (e) four-scan-line offset, (f) 3-D surface of the can (g) 3-D mesh of the can. 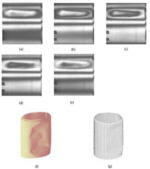 Fig 3a: (a) 3-D surface and (b) 3-D mesh of the tooth plaster. Fig 3a: (a) 3-D shaded surface of the spine. (b) 3-D mesh surface of the spine. Moirי interferometry is widely used in the deformation studies of microelectronics packaging. The trend towards development of smaller and more functional packages, makes the reliability of the packages very critical. The limitation of commercial moirי interferometers to monitor the deformation at the micron level is highlighted in the fringe patterns of a Quad Flat Pack package. The critical regions around the die corner and copper lead-frame interface exhibit fringes with large gradient. Limited spatial resolution limits strain determination away from the critical areas. These are resolved using the Fiber Optic Micro-Moirי Interferometer as shown in the lower figures. A new optical strain sensor is developed to rival the traditional electrical strain gauge. It directly measures in-plane strain using a high frequency grating and two Position Sensor Detectors (PSDs). The strain measurement is independent of the rigid body motion of the grating. It uses only the specimen grating without master grating. The specimen grating with a high frequency (generally 1200 lines/mm) attached on the surface of a specimen is illuminated by a focused laser beam. The centroids of diffracted beam spots from the grating are automatically determined with two PSD sensors connected to a personal computer. 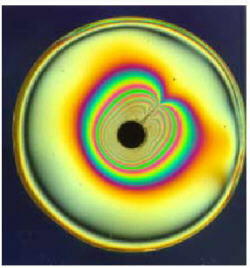 The shift of diffracted beam spots due to the specimen deformation is then detected. Several measures for improving strain sensitivity are taken. The residual strain error is analyzed due to the misalignment of laser and grating. The measured strain is directly displayed on the monitor both in digital and graphical forms in real-time. It can be applied in the domains of precision metrology, micro-electronics, mechanics of advanced materials, micro-mechanics. In many laboratories of universities and industrial organizations, commercial polariscopes have the relative position of the two quarter-wave plates fixed. This is due to the requirement of transforming a plane polariscope to a circular polariscope with greater precision and ease. Unfortunately, these polariscopes cannot implement Patterson & Wang’s phase-shifting algorithm because this algorithm requires the second quarter-wave plate and the analyzer of the circular polariscope to be capable of independent rotation. A new phase-shifting method is developed which can be applied under these constraints. 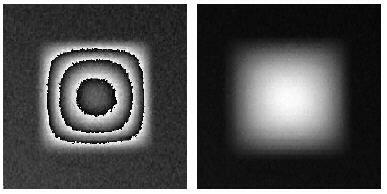 Fig 19: Four phase shifted images obtained smultaneously. 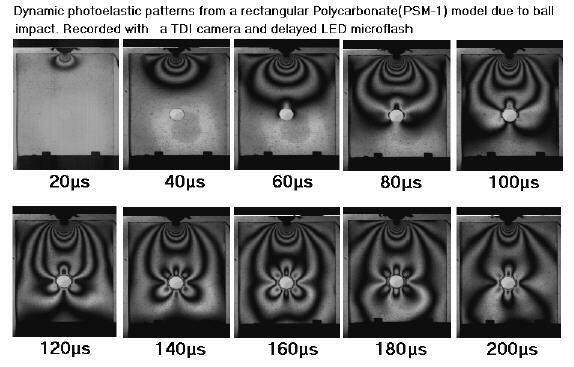 The possibility of applying phase-shifting photoelasticity on real-time event depends on the realization of simultaneous observation of the phase-shifting images required for automatic analysis. A novel instrument in this contribution is established and described for this purpose. A critical device called “Multispec Imager” is introduced to digital photoelasticity for the first time, which can split the optical energy of an object into four identical paths, thus make it possible to generate simultaneously the required four phase-shifting images. The result obtained from a simple experiment analogous to a bending test demonstrates the practicability of this system. Using the novel two load step method, the isoclinics and isochromatics can be separated without ambiguity. The figure below shows the final result for three incremental loads recorded while the specimen was fatigue loaded. 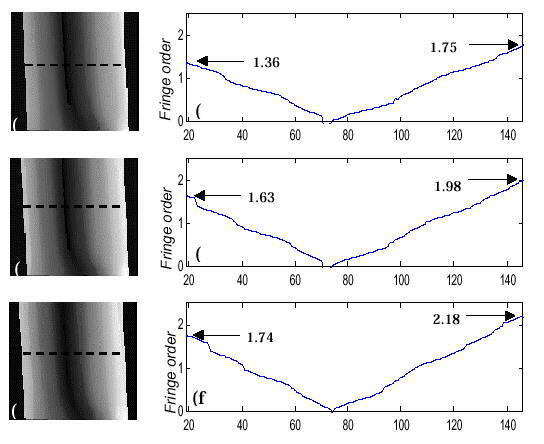 Fig 20: Unwrapped phase maps for three different loads. The fringe orders at the end points of specimen are given for comparison. Fiber Optic Sensors are among the preferred sensing material in smart structure applications due to their immunity to electro-magnetic interference, small size, lightweight and compatibility with the host material. In addition remote sensing is easily accomplished where the test specimen with the sensing fiber is placed in a harsh environment and the sensed information transmitted by optical fibers to a remote site for evaluation. Development in fiber optics owes much to the communication industry. Their use as sensors is however still under study, primarily because communication fibers were designed for the information-carrying beam traversing the fiber to be transmitted undistorted over large distances. On the other hand, as sensors it is necessary that the external loading influence the transmitted beam which can then be traced back to cause. As such the sensing part of the fiber is but a small portion of fiber length with the rest still being used to transmit the distorted signal to the processor. Basically fiber optic sensors can be classed according to the light modulation mechanisms. Intensity sensors are the most rugged but the least sensitive as they rely purely on the light intensity and can generally distinguish on/off characteristics only. Interferometric sensors are at the other end of the spectrum providing high sensitivity but with difficult handling characteristics. For smart structure applications, sensors in between these two extremes would be most suitable. While the birth through health monitoring approach is a longer-term programme, several structure systems are being explored. Amongst them is an on-line Aircraft Structural Health monitoring system using fiber optic sensors. Two avenues are being explored, mimicking nature. The first is a global warning system, where in the entire structural component is monitored. In this the goal is to provide an overall health status of the component. This is similar to our human response of rise in body temperature due to illness. The second is more specific testing, in which quantitative values are analyzed at different locations and the damage then completely identified in respect of size, location and severity. Of course, this stage requires longer examination, but it is envisaged that this could be accomplished without significant downtime. This would provide conclusive evidence as to whether the aircraft needs to the “hospitalized” for a complete check-up repair or removal from service. The methodology, with minor modification, could equally apply to civil structures and roads and highways. The fiber optic sensor to be evaluated can be categorized as global and discrete. Global sensors include the OTDR (Optical Time Domain Reflectometry), and the FOPS (Fiber Optic Polarimetric Sensor). The discrete sensors the EFPI (Extrinsic Fabry-Perot Interferometric) sensor and the Bragg Grating strain sensor. The principles of these sensors have been demonstrated as regard strain and temperature measurement. Fiber Bragg grating provide discrete yet multiplexed strain/temperature measurement capability by reflecting a specific wavelength which shifts due to a strain induced change in grating frequency. The OTDR system relies on back scattered light from flaws to detect location of fiber breaks and defects. As such its immediate use in locating strain induced brakes in the optical fiber. However, some preliminary work has also exposed some other possibilities, which are being investigated. Finally the Fiber Optic Polarimetric Sensor (FOPS) provides greater sensitivity than intensity sensors but with higher ruggedness compared to interferometric sensors for continuous health monitoring of the structures. The sensor can be surface mounted or embedded in composite or concrete material. A damage factor (DF) parameter is introduced to describe the stiffness reduction of the specimen for the first time. Based on this parameter, the experimental results show that the two sensors can be used to quantitatively describe the growth of cracks and prediction of residual load carrying capacity of aluminum structures. Besides the FOPS can also applied for a variety of static, dynamic and impact studies as shown in the response below. Notably its use for on-line vehicle weight monitoring is quite interesting and useful application. The Hi-Bi, Lo-Bi and Single mode fibers each have a different advantage in specific applications. The figure below shows a schematic of the set-up that has now been packaged into a portable unit for field applications. The next set of figures are typical response for static, continuous, dynamic and impact loading showing the versatility of the method. Current development in MEMS place unprecedented requirements on materials and designs. To ensure optimum process parameters, the reliability and functionality of MEMS devices, many research efforts focus on measurement and testing technologies. Digital holography is a novel technology with great potential in the area of non-destructive measurement. Its successful applications in MEMS depend on the incorporation with microscopy to handle the challenges of micro-scale size and the surface optical properties of microstructures. At the same time, improvement of measurement performance is urgently required so as to meet the needs of high accuracy and resolution. In this project, In-line digital micro-holo-interferometry (IDMHI) is proposed with the advantages of relaxed spatial resolution requirement, higher lateral resolution and less speckle noise. Furthermore the use of a long distance microscope provides broad working distance, typically 50mm-2200mm, high lateral resolution of 1.75mm (NA=0.19)and high flexibility. The figure below shows the experimental layout of the system and the corresponding digitally sampled holograms before and after loading. The specimen was a MEMS pressure sensor. 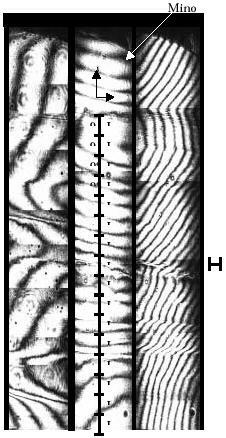 The two images can be reconstructed numerically and their phases subtracted to give the deformation pattern shown below. This can then be unwrapped to obtain the phase and profile the deformation. The displacement field is measured with the resolution of about 1nm. The objective of this project is to apply photonics technology to bio-safety management of genetically modified (GM) plants. The conventional method for screening GM plants is through selection using antibiotic resistance markers. There is public concern with such approaches and these are associated with food safety issues, escape of antibiotic resistance genes to pathogenic microorganisms and interference with antibiotic therapy. Thus, the strategy taken in this project is to replace antibiotic resistance markers with fluorescent protein markers that allow for rapid and non-invasive optical screening of genetically modified plants. In this paper, fibre optic spectroscopy was developed to detect and quantify recombinant green (EGFP) and red (DsRED) fluorescent proteins in vitro and in planta. In vitro detection was first carried out to optimize the sensitivity of the optical system. The bacterial expression vectors carrying the coding regions of EGFP and DsRED were introduced into Escherichia coli host cells and fluorescent proteins were produced following induction with IPTG. Soluble EGFP and DsRED proteins were isolated from lysed bacterial cells and serially diluted for quantitative analysis by fibre optic spectroscopy using different light sources, namely, blue LED (475 nm), tungsten halogen (350 – 1000 nm) and double frequency Nd:YAG green laser (532 nm). Fluorescence near the expected emission wavelengths could be detected up to 320X dilution for EGFP and DsRED with blue LED and 532 nm green laser, respectively, as the excitation source. Tungsten halogen was found to be unsuitable for excitation of both EGFP and DsRED. EGFP was successfully purified by size separation under non-denaturing electrophoretic conditions and quantified. The minimum concentration of EGFP detectable with blue LED excitation was 5 µg/ml. The spectograph below shows the correlation between fluorescence intensity counts and red fluorescent protein concentration using 532 nm green laser for excitation. Dental caries is an infectious, communicable, multifactorial disease in which bacteria dissolve the enamel surface of a tooth. Uninhibited, the bacteria may penetrate the underlying dentin and can result in extensive loss of tooth structure and discomfort. Consequently an excruciating pain due to dental pulp necrosis, tooth extraction and loss of dental function is common. It is important to note that the failure to meet the minimum standard of having six opposing teeth was a leading cause of rejection from military service in both world wars. The major etiologic factors causing this disease are specific bacteria in dental plaque (particularly Streptococcus mutans and lactobacilli) on susceptible tooth surfaces and the availability of fermentable carbohydrates. To date, there are no effective measures to prevent this disease, and the most frequent treatment was tooth extraction. Caries activity test evaluate a patient’s current status with regard to dental caries, distinguish between active and arrested disease and predicts future disease and disease progression. They enable the dental professionals to formulate and in-cooperate a treatment plan for the patient. Many attempts have been made to establish the risk profile of dental caries; however, no diagnostic test procedures are yet available to reliably predict such risk particularly among the pediatric and adolescent population. A fiber optic evanescent wave spectroscopic based method has been developed to determine the variations induced by the bacteria. This method can predict the caries activity directly from the subject’s mouth in a very short time. An additional bacterial incubation and culturing period is not required. Further studies are indicated to determine their sensitivity and specificity based on test in large population. An experimental investigation conducted to determine the proportion of methanol by volume in methanol-gasoline mixture was conducted. The suitability of a Fiber optic Raman spectrometer for in-situ measurement of percentage of methanol by volume in methanol-gasoline is demonstrated. The transformation of Raman spectra of gasoline into Raman spectra of methanol are observed and recorded as the percentage of methanol is progressively increased from 0 to 100%. The measured intensities at the characteristic Raman shift corresponding to gasoline are found to be inversely proportional to the volume of methanol in methanol-gasoline mixture. The results obtained in the form of series of Raman spectra are presented. First is a typical Raman spectrum of Ethanol and unleaded petrol. Then a series of images of Methanol diluted by water. I would like to acknowledge the support of the MoE and NTU for their support of this project through grant MLC 1/97. I would also like to thank the School of Mechanical and Production Engineering and the Strength of Materials Lab. at NTU for providing lab support, technical and graduate manpower for this project. Finally, the work of the co-investigators and students involved in this project is gratefully acknowledged.